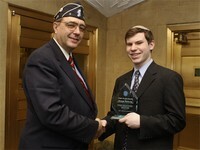 Mar 2, 2004 — Shalom Sokolow, a junior at Marsha Stern Talmudical Academy – Yeshiva University High School for Boys, was given a plaque and $1500 during a ceremony March 1 for his first place finish in the second round of the 2004 American Legion Oratorical Contest. Mr. Robert Corrigan, American Legion chairman of Zone 1, and Mr. Nicholas Kleszczewski, New York County commander, made a special trip to MSTA to commend Mr. Sokolow for his outstanding performance. The American Legion Oratorical Contest is composed of four rounds: district, zone, state, and national. MSTA competes in the Manhattan and Bronx district and in Zone 1, which comprises the Bronx, New York, Westchester, Rockland, Putnam, Dutchess, and Orange counties. During the contest, competitors must exhibit their knowledge of the U.S. Constitution by writing and delivering an eight to 10-minute memorized oratory on a subject of their choice. They also respond to an extemporaneous choice of amendments in a four-minute speech. Mr. Sokolow won the zone competition based on his discussion of military tribunals, but was unable to compete in the state competition because it was held on a Saturday morning. In previous years, the state round was held on Saturday evenings and MSTA has had two state winners: Hillel Deutsch and Eitan Schnall. In addition to the two American Legion representatives, the ceremony included Dr. Michael Hecht, dean of MSTA; Mr. Sokolow’s parents, Judy YH ‘65 and Dr. Moshe Sokolow, professor of Bible at YU; Mrs. Harriet Levitt, head of the English department; and Ya’acov Sklar, principal of MSTA.